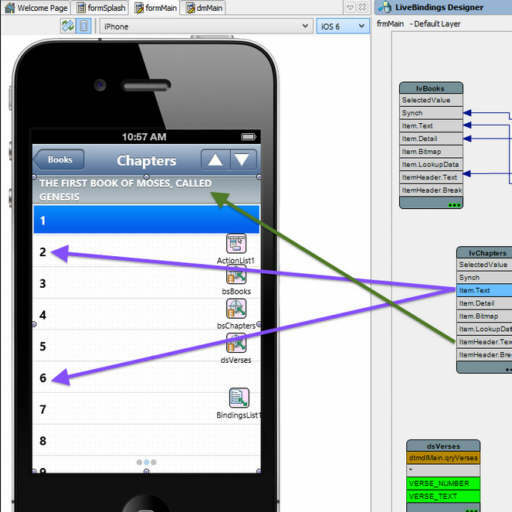 Embarcadero has a blog post up by Stephen Bell with a tutorial on how to build an ebook application using Delphi XE5 Firemonkey. He used FireDAC, Interbase, and Visual Livebindings with the sample book being the Bible. Apparently the Bible comes in at only 8 megabytes so it easily fits into an app for Android and IOS. Source code is provided so you can download it and use the app to modify and suite your own needs. I would recommend switching it to SQLite from Interbase if you do. The application uses TListView and master detail views. Using the Bible as the sample book for the app was a good choice because of the amount of books and chapters within it makes it really demonstrate what the app can do. The app demo is already setup to be cross platform and compiles to Android and IOS. Check out the full blog post over at Embarcadero and download the app source.